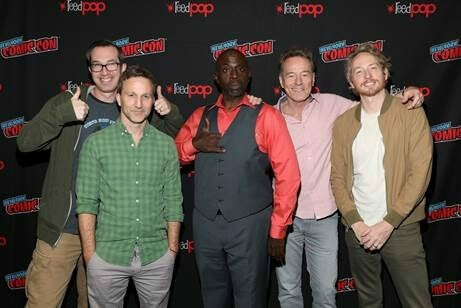 Co-creator Matthew Senreich, actors Breckin Meyer, Gary Anthony Williams and Bryan Cranston, and co-creator Zeb Wells at Sony Crackle’s ‘SuperMansion’ panel. Sony Crackle’s SuperMansion voice cast members Bryan Cranston, Breckin Meyer, and Gary Anthony Williams joined series creators Zeb Wells and Matthew Senreich for a wide-ranging press conference at the 2018 New York Comic Con. It was evident from the hysterical press conference that the talent behind the Emmy-nominated SuperMansion obviously enjoy each other’s company. It was also obvious that no topic was off limits, including Bryan Cranston’s private parts. What’s the most fun aspect of hearing the voices bring the characters to life? There are so many creative minds on this. Do they go off script? As the executive producer, have you ever had to flex your power at all? And your rap name is? Was the Comic Con episode inspired by real experiences? Season three seems more epic in scope. Was that a conscious decision? Has there ever been any plot line or script where you just couldn’t wind up doing it? Is there anything the voice actors have recorded that makes you change the story? When you’re working on how you’ll voice a character, where do draw inspiration from? Is there a guest voice you really want to get on the show?